Recently a colleague on the Traditional Fighting Arts forum posed this question and it gave me pause to consider. "How do you lead off strikes? 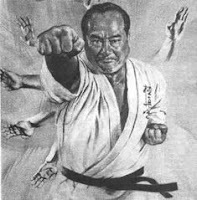 I was never explicitly taught to lead with one or the other until I started my Daito-ryu training, and my teacher was very specific about leading with the hand and then powering with the body after. It was weird at first, as I had always naturally moved from my hips with the assumption that my hand, held steady, would be powered by that. This method actually started to make sense to me a while back, as it is slightly faster, hence why bouncy tag sparring can strike quickly without using body weight. 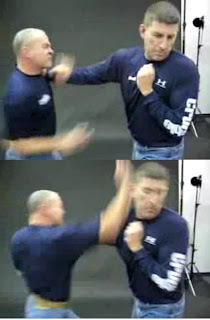 I recently saw the same thing in Kelly McCann's combatives training videos, however, he throws his whole body behind the strike. In the video below he explains that it comes from the back heel, but if you watch him do the technique, he's moving his hand first." Indeed I have been told in my internal arts training to think of the hand leading the body - not the reverse. On the other hand you will note from my article "Telegraphing vs. staged activation" that I am a firm believer that "staged activation" is necessary to maximise the force being applied by a particular technique (in other words you work from your biggest body parts, specifically your hip, to your smallest joints (shoulder, elbow, wrist)). So which is it? Does your hand lead or does your body? 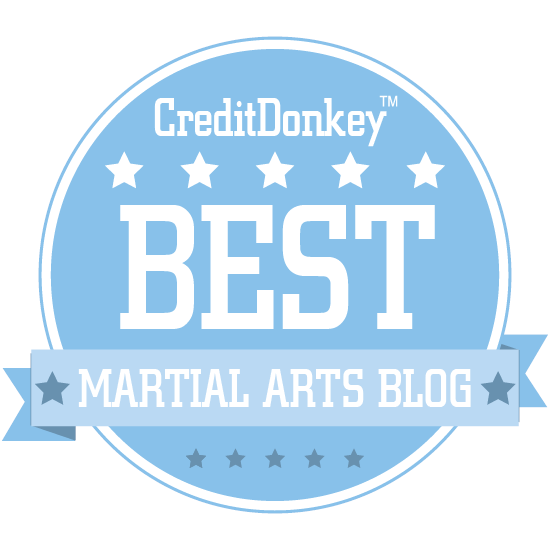 Synchronously enough, my brother Nenad, my good friend Colin Wee, Jeremy "The Anvil" Allen and I were talking about this very topic topic during a sponsor's break on the "Martial Arts Talk Show" (on SportFM 93.1) last Sunday. Jeremy told us how the Australian Institute of Sport had determined that only about 15% of the force applied by a punch comes from your arms. About 60% comes from your hips. 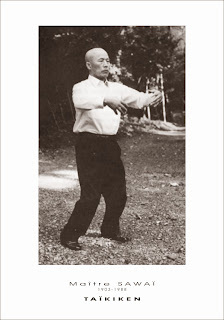 The remainder comes from the momentum of your whole body as you lunge or step forward. This fits in neatly with my views on staged activation. But how does it compare to Shidokai's observations? What is going on? First I will say this: I think the hand cannot help but move when the hip starts to move and vice versa. They are, after all, connected. The hip will "finish" before the punch - which is all that matters. In other words, it is how they end that determines "staged activation", not how they start. The hand and hip probably start together in all experienced students. Neither "leads". It is hard to tell in the McCann video because his hips are obscured, however if you look closely you'll note that his hips have actually turned fully before the strike has landed. In other words, Kelly's hips are pretty much in the same position (ie. his torso has the same amount of rotation) in both the "mid-movement" snapshot and the "finished position" snapshot on the left. What confuses the viewer is that Kelly has moved forward (where the last 25% of Kelly's force is being applied). His level of hip rotation is however constant from mid-way through the strike until the end. 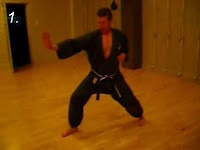 A clearer example can be found in stills taken from the video of my brother Nenad doing a gyaku zuki (reverse punch). It is a particularly apposite sequence because it is an "ideal" - intended to illustrate the very principle of "staged activation". When this video was taken I was under the impression that the hip moved before the fist. In fact, it doesn't. 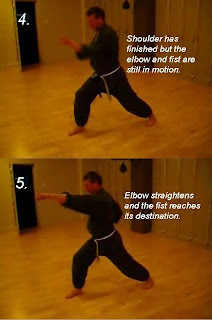 You'll note in picture 1 to the right the starting position for the basic, isolated reverse punch. Note carefully the position of the hips, the shoulders and, in particular, the left fist (with which Nenad is going to punch). Picture 2 on the left shows Nenad a fraction of a second into the punch. 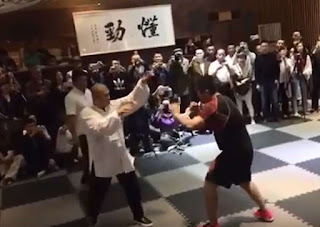 If you look clearly you'll note that the hip, shoulders and fist have all moved. 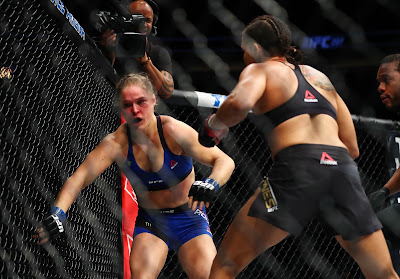 I froze this image as soon as I practicably could after the commencement of the punching sequence. I could find no position where the hip was moving and the fist was not. They are tied together - as one would expect. 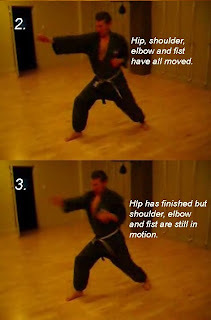 It is impossible to move the hip and not move both the shoulders and the fist. By picture 3 you'll note that Nenad's hips are fully rotated. If you doubt me look at picture 4 below. 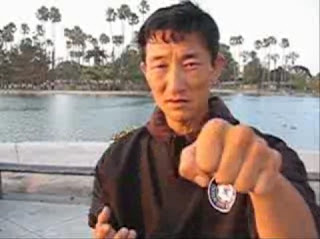 However his shoulders, elbow and fist are still blurred indicating movement. In other words, while they started together, the hip has finished first. This is unsurprising since the rotation of the hips is a relatively small movement compared to the distance the fist must travel. In picture 4 you will, again, note how the hip is still the same as in picture 3. However in this instance, Nenad's shoulders have reached their final position (relative to picture 5). The elbow is still straightening and his fist is blurred indicating movement in the rest of the arm. Finally in picture 5 you see the finished position. You will note a small additional turn in the hips at the end which is due to Nenad's over-turning (a matter I shall have to bring to his attention!) however this is irrelevant to the punch. 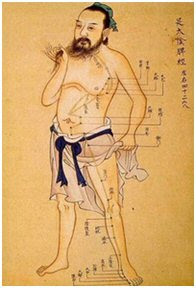 The functional hip use was completed in pictures 1-3. The fact that Nenad has overturned slightly at the end is neither here nor there. What can we make of this? The answer to the question of which leads - hand or body - is this: neither. The body starts moving as an integrated whole. However which part finishes first is very interesting. It is here that we find all the subtlety that makes for effective staged activation. Your extremities need to finish moving after your torso in order for there to be an effective transfer of momentum from you to your target. 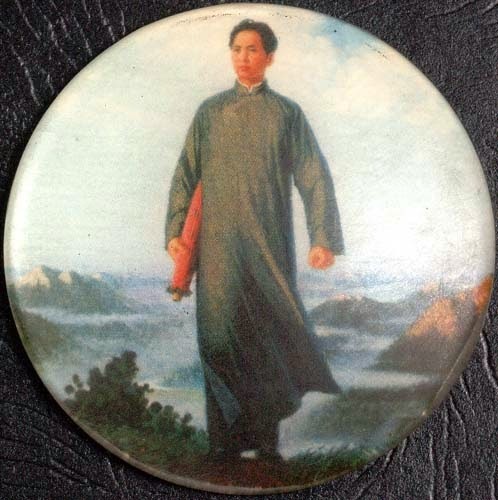 If you find you can't quite apply the same force in the heat of combat that you might against a makiwara or bag, it isn't because you've "led with the hand"; rather it is because you haven't had the opportunity to set up an optimum load (as you can against a stationary target). Accordingly "which leads - hand or body?" is the wrong question. The question should be "which finishes first - hand or body?". The answer is: "the body" (if by "body" we mean the larger parts of your body). 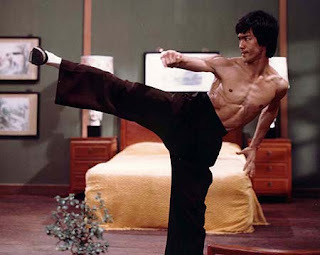 Having said all this, I must say that what body part you think of when moving in combat (ie. which body part you focus on) can be important. 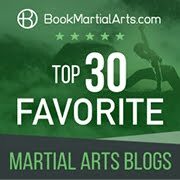 For everyone but the rank beginner, thinking of your fist when punching is going to be more productive than thinking of your hip. By the time you've inculcated staged activation into your movement, you won't need to "think" of your hips moving into a punch - much as you don't consciously think of moving your feet up and down as you climb stairs. Your body's kinaesthetic awareness deals with such tasks on a subconscious level. On the other hand, focussing on moving the hip first can have the effect of (a) slowing you down and (b) telegraphing your intention - particularly when you decide to use a "double hip" as discussed in my "Whole lotta shakin'" article series. In the end, if you want to punch, just punch. The body will follow suit whether you like it or not. If you want to improve the effectiveness of your technique, pause to consider which body part is finishing it's movement first - don't worry about which part should "lead".